I wore this sparkle top to work last week and got a ton of compliments. I think I bought the top two years ago for a New Year’s party. After rediscovering it in my closet I decided it was time to jazz it up for work. Everyone loved how sparkly I was! Even my boss said she loved it. So can you wear sequins to work? I say yes. You are seriously so cute. LOVE that outfit! It looks awesome! Super cute!! Yes sparkles for work! If only you had my gold sparkle shoes to match… then you'd be SERIOUSLY festive. Haha! 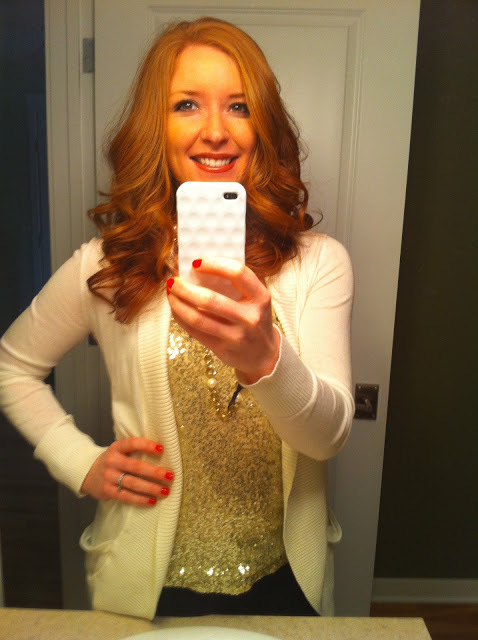 I wear sequins to church lol so of course you can! and I still can never get over your beautiful hair! LOVE this outfit! 🙂 And your hair. So cute!! your outfit is so cute and i love, love, love your hair. so pretty. I love it and it's totally work appropriate. You're such a fashionista! Oh you know your so cute in this top! I love your red boots with your dog. Yes I say sequins are in for work! yeah you can!!!! =) I love it! What a fun way to spice up work a bit! your hair is GORGEOUS! Come style mine? Love the shirt and that phone cover is so cute too! I see a theme here….sparkle boat, sparkly top, what's next? Of course you look fabulous!